Yay for last car payment!!! Good luck with the house :) We have two dogs as well and selling our house was almost the death of me with all the sweeping and vacuuming! Word. I feel like all I do is clean floors! My Altima is making some might strange noises these days too! Congrats on paying it off..that's awesome! Okay, I'm glad it's not just mine. Love the car, but she's a noisy one! 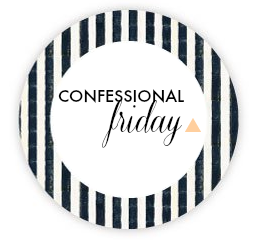 This is not confessional at all.... but WHERE DO YOU GET ALL YOUR ADORABLE BOWS FOR C??? Was creeping you on instagram and can not get over all the bow cuteness! Congrats on paying off your car! That has got to be such a great feeling! Okay, I seriously lost my phone charger that way last week! Went to charge it and...couldn't find it. I had shoved it into an end table drawer, which we never use. Haha!! man, i have been loving the heat! the humidity, not so much. i love arkansas summers even when it gets up 109 i still love it. but that's mainly cause i loose 10 pounds every summer sweating in our warehouse here at work. i've grown to love being hot. lol so weird i know but it's way better than negative 16. just saying. one time when i went to look at houses i went into one of the laundry rooms and the lady who lived there left two of her bras hanging up to dry. omg i was thinking she probably DIED when she saw she left those out. i totally would. Yeah, our house is recently listed too and the keeping it clean with a 3 year old is driving me to drink. It's so stressful! This baby needs to sell STAT. Yes ma'am, it is the PITS. Give me alllllll the wine! ; ) Cheers to selling quick! Leslie, I think I may need to take a tip out of your book and get myself a teeny fan! Heat= no bueno! It was such a glorious day to submit the last car payment on our Tahoe! My husband also said that I'm driving the Tahoe until the wheels fall off!! I just hope they don't fall off while we are driving :) Have a great weekend!